Cost, comfort, control. Brief on OpenTRV's 58-home winter field trial of its TRV1.X smart thermostatic radiator valve in Wembley/Brent social housing. Radbot is an evolution for your heating systems. Radbot saves tenants 30% to 50% of their heating bills and carbon footprint, while helping to manage property assets better. Local authority and other housing providers. Finance, sustainability and regeneration executives. Radbot brings tried and tested commercial building heating efficiency techniques to the home, by only heating rooms that are actually in use, driven by unobtrusive occupancy sensing and soft zoning, ie radiator-by-radiator control without new pipework. Radbot can be fitted without requiring skilled trades or building works. From a user perspective, it requires no complex interactions with apps or programmable displays, unlike other smart heating solutions. It’s fit and forget, working intelligently in the background delivering real savings. Radbots can be fitted in place of individual traditional mechanical TRVs for a target 30% energy saving per upgraded radiator. Radbots can also be fitted alongside a companion boiler controller in place of a conventional whole-house two-wire mechanical thermostat to raise target savings to 50%. See OpenTRV's Radbot: How Does it Work? Radbot brings tried and tested commercial building heating efficiency techniques to the home, by only heating rooms that are actually in use, driven by unobtrusive occupancy sensing and soft zoning, ie radiator-by-radiator control without new pipework. Radbot can be fitted without requiring skilled trades or building works, or tricky programming or connecting to the Internet. Nor are there any complex interactions with the occupiers - fit and forget. Radbots can be fitted in place of individual traditional mechanical TRVs for a target 30% energy saving per upgraded radiator. Radbots can also be fitted alongside a companion boiler controller in place of a conventional whole-house two-wire mechanical thermostat to raise target savings to 50%. Those energy savings are money in the bill-payer’s pocket, and also cut carbon emissions and climate change. NEA launched its Technical Innovation Fund in 2015 with the aim of evaluating new innovative technologies that had potential to support UK households in fuel poverty. In partnership with local fuel poverty charity Energy Solutions and social housing provider Network Homes, OpenTRV secured funding to deliver a 16-month field trial of Radbot. The project presented an opportunity to test Radbot in a real-world scenario with the aim of verifying energy saving calculations and developing valuable insights into product user acceptability, installation and maintenance and data collection and analysis procedures. From a pool of ~400 homes with EPC [EPC] ratings below C and identified as at risk by Network Housing, Energy Solutions conducted a user-engagement exercise recruiting 58 homes to participate in the trial. About 200 prototype Radbot units were installed during the winters of 2015/17 along with gas consumption monitoring equipment to enable accurate energy use to be calculated. During the installation, each household also received face-to-face advice on how the product operated as well as general energy saving tips. The trial produced a number of useful insights. Verification of 30% energy saving — for households where a full data set was obtained (4), an average 30% reduction in gas consumption was observed. Drop outs and technical issues with remote data gathering unfortunately resulted in a smaller than forecast data set. This in part was due to the vulnerable and transient nature of the trial population group. Product acceptability — the majority of feedback on product usability and understanding was positive with people reporting that its similarity to a standard TRV made it easy to understand. Some households raised concerns over the noise of the motorised screw value particularly when located in bedrooms and the robustness of the mechanical connection of the device to the radiator valve. OpenTRV is using this feedback on the prototype to improve the design and performance of its next generation Radbot. Data sharing — participants were more receptive than anticipated to the sharing of data. 98% of households agreed to provide consent for their energy consumption and Radbot data to be collected and shared with selected third parties indicating that where a tangible benefit is perceived to exist for a household, the sharing and use of data sharing is acceptable. We know that zonal heating controls work in the non-domestic building sector delivering significant savings. We wanted to design a product that could do the same in a domestic setting but at the same time be so easy to use that anyone could benefit. The Brent trial provided us with an opportunity to test the product at scale within a real world situation. It was really encouraging to see our predicted energy savings verified in a real world setting even if with less data than we would have liked. The feedback on what did and didn’t work well has been invaluable and we are using this to develop and refine the product. Our vision is to provide a cost effective retrofit device that can be rolled out at scale and deliver a significant reductions of both carbon emissions and fuel poverty risk in the UK. Reduced energy bills — from the moment they are fitted, Radbots will start to optimise control of the heating system only providing warmth when it’s actually needed. This has the potential to reduce consumption by 30%+ delivering saving of £200 - £300 pa for an average household using gas fired central heating. Carbon savings are expected to be ~0.2tCO2 to 0.25tCO2 per radiator per year. Improving comfort — tenants no longer have to suffer rooms that are either too hot or too cold. Radbot learns the individual occupancy and heating requirements for each room ensuring just the right temperature wherever you are in the house. Maximum benefit for minimum effort — nobody wants to spend time fiddling with complex controls or regularly logging into an app to control their temperature. Radbot takes care of the hard work, working intelligently in the background to save money and improve comfort. OpenTRV aims to empower housing providers to deliver affordable warmth for their tenants — reducing tenants’ risk of fuel poverty and improving their finances which in turn can help to reduce the incidence of rental arrears. Sustainable communities — wide-scale rollout of Radbots has the potential to make a significant reduction in carbon emissions. We estimate that if a Radbot was fitted to every radiator in the UK this would reduce the UK's carbon footprint by 5%. Encouraging positive change — Radbot data can be analysed at an aggregate or individual level to provide direct feedback to tenants and encourage positive behaviour change eg drying clothes on radiators where high humidity is detected. Efficient asset management — remote occupancy monitoring for detection of illegal subletting or void management insurance criteria; early warning of damp and mould growth or trend analysis of boiler faults to improve maintenance interventions. When combined with other data sets these are just some of the ways in which Radbot data could be used to provide cost efficiencies. These are just some of the ways Radbots could support housing associations deliver sustainable inclusive communities. Energy Savings are calculated using typical scenarios and trial data. Target payback period based on forecast energy saving and purchase costs. Radbot is a painless incremental low-risk route to improve tenants’ heating and even health, especially where building fabric updates are difficult. Those savings are also in money and CO2 emissions. [BGHER] British Gas Home Energy Report 2011 (PDF). [Coc2017] Potential energy savings achievable by zoned control of individual rooms in UK housing compared to standard central heating controls J Cockroft et al 2017. [ESTcalc] Energy Saving Trust: Our calculations: "For our savings, we present figures as simply as possible that we expect to best represent typical homes commonly found across the UK." [EUETV] EU Environmental Technology Verification. [GLACO] Review of Carbon Offsetting Approaches in London (PDF), NEF/GLA 2016: "... 22 out of 35 London Planning Authorities (LPAs), i.e. 61%, currently apply carbon offsetting payments in lieu of any shortfall in on-site carbon dioxide reductions ..." (which may be as high as £1800/t). [NEA] NEA: "National Energy Action is the national charity working to end fuel poverty in England, Wales and Northern Ireland." [OfgemTDCV] Typical Domestic Consumption Values. [UVocc] The Smart Thermostat: Using Occupancy Sensors to Save Energy in Homes: Lu et al, University of Virginia, 2010. 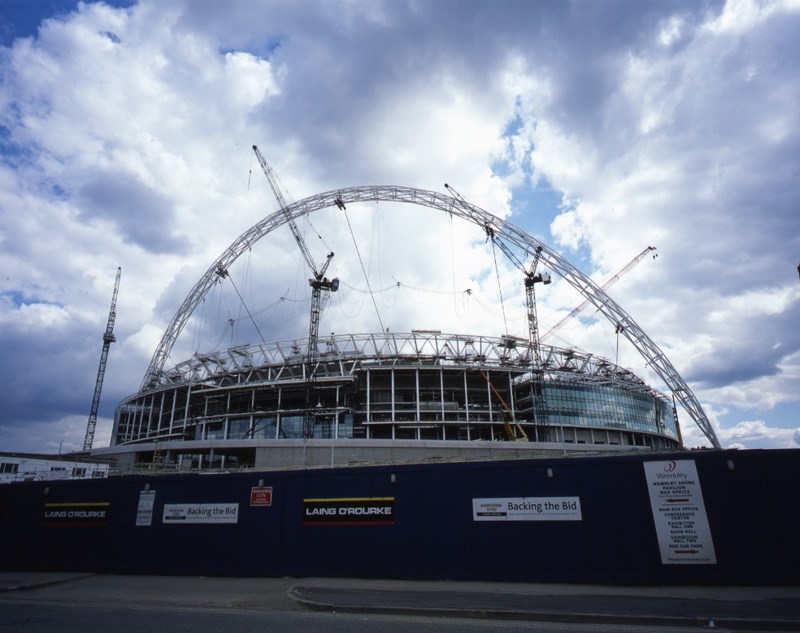 Wembley stadium 'work in progress' photo (~2006) c/o Adam Hart-Davis. First published 2017-11-15 , updated 2019-04-17 , rebuilt 2019-04-19 . Site copyright © 2007-2019 Damon Hart-Davis. Hosted by ExNet.